On the night of the census on 31st March 1901, Isabella, 9 months, was living on Bogberry Street, Ennistymon, County Clare, Ireland with father Thomas, 42, policeman in the RIC, mother Isabella, 26, brothers John William, 3, and Thomas, 2. In 1911 when she was 10, Isabella was living on Military Road, Birr Rural, King’s County with father Thomas, clerk in a coal and timber yard, mother Isabella, siblings John William, 13, Eileen Kate, 7, Alice Louisa, 5, George Benjamin, 4, and Gerald Dean, 1. 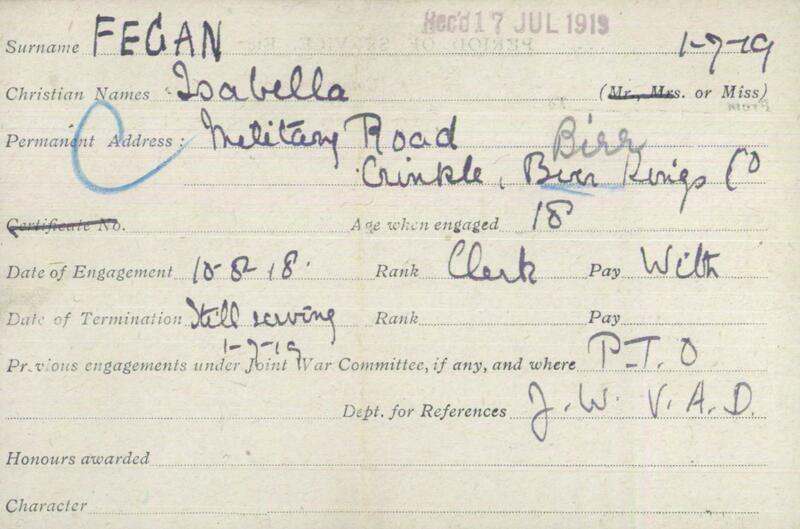 Military Road was in the village of Crinkle (see her address in 1918 below). Isabella volunteered to serve as a V.A.D. member of the Birr Nursing Division of the Red Cross when she was eighteen. 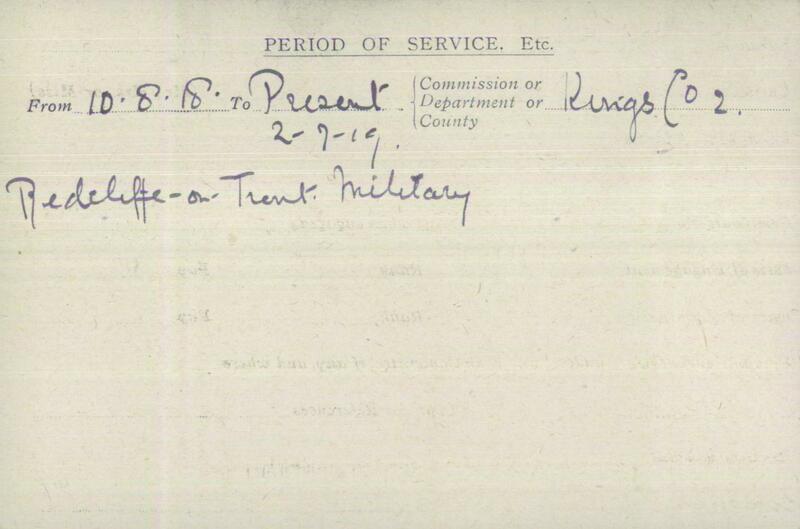 She served from 10th August 1918 to 2nd September 1919 at Notts County War Hospital Radcliffe on Trent, then at A.D.M.S. (Assistant Director of Medical Services) Office, North Midland District, Nottingham. She worked full time as a shorthand typist and was still serving when her Red Cross record card was completed in December 1919. The date on which she moved from Notts County War Hospital is not recorded. On 4th October 1924 Isabella travelled alone to Brooklyn, New York from Liverpool on the S.S. ‘Celtic’. Her occupation was given as ‘typist’ and her last permanent residence was recorded as ‘England’. Her father’s address was given as Thomas Fegan, Crinkle, Birr, Kings County. In the New York State census 1925 Isabella was living at 321, 64th Street, Brooklyn with brother-in-law Thomas Delahunt and her sister Eileen Delahunt. Her occupation is recorded as stenographer. Isabella married Francis J. Daly on 23rd August 1927 in Brooklyn. In 1930 the couple were still living in Brooklyn. Francis was a clerk and Isabella a stenographer in an engineers’ office. It has not been possible to determine Isabella’s date of death or whether she and Francis had any children.